A similar break up is also asked in the Annexure II of Form 24Q i.e. 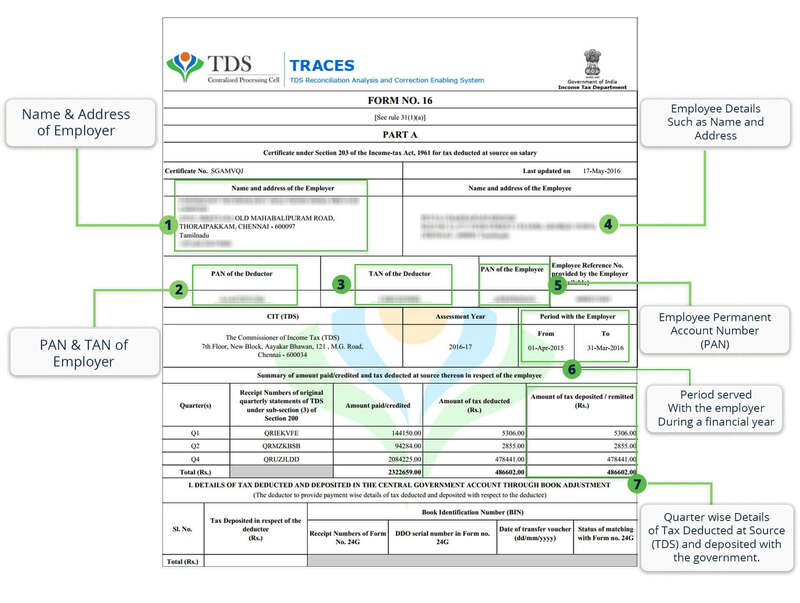 TDS Return and ITR Form. 2- The amount of Standard Deduction u/s 16(ia) is required to be disclosed now onwards. 3- A specific list of all available deductions as per chapter VI-A is required separately. A similar break up is also asked in the Annexure II of Form 24Q i.e. TDS Return and applicable ITR Form. 4- Education Cess has been replaced by Health and Education Cess. Changes have been made both in Part -B of Form 16 and Annexure II of Form No 24Q [ TDS Return]. 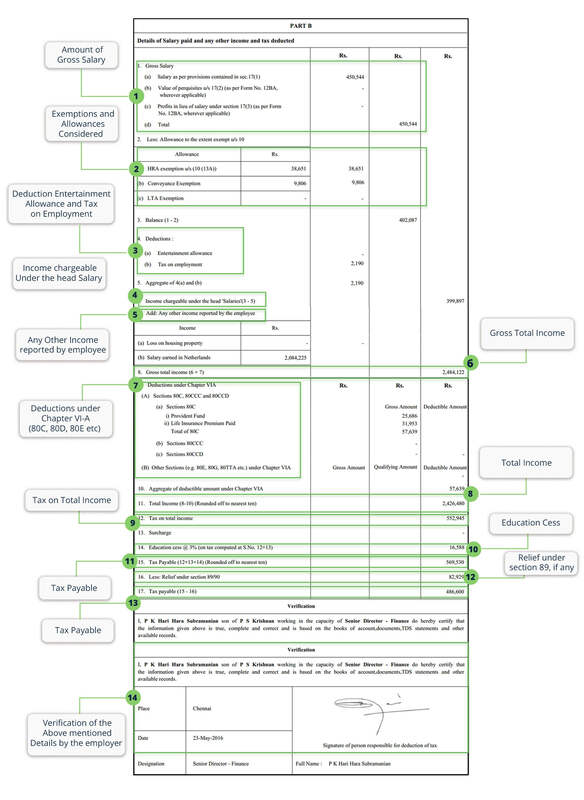 ITR Forms have also been recently released for AY 2019-20 by the income tax department, where detailed break up is asked. Considering the changes, now break up of the Income, Deductions, Exempt allowances/receipts is to be provided by the Employer and employee both. Thus, the income tax department will put the checks for the possible evasion of tax. Also, it will be easy for the taxpayers to fill the ITR as proper information will be available in Form 16. ITR Form is also changed this year where the break up of salary is being asked as per the format of Form 16. Download the new Form 16 Format applicable for FY 2018-19 : AY 2019-20. ITR for this year is required to be filed till 31st July 2019. A Form 16 is a certificate issued to salaried individuals from their employer when he deducts tax from the employee salary. In simple words, it is an acknowledgement which states your deducted tax has been deposited with the income tax department. Form 16 is an important document that is issued in accordance with the provisions of Income Tax Act,1961. A form 16 contains details of the amount of tax deducted at source (TDS) on salary by your employer along with the salary breakup for the financial year. In a nutshell, it could be said that a Form 16 is a certificate of proof of the TDS deducted & deposited by your employer. When Form 16 is to be issued? How to understand Form 16? How does the Form 16 process work? Why do I need Form 16? I lost my Form 16, what should I do? Is Income Tax Return and Form 16 same? I haven’t received any Form 16 from my employer; do I still need to file my income tax return? I haven’t received Form 16, how do I calculate my Salary Income? My employer has deducted tax from my salary, but neither did he issue me a Form 16 nor does my Form 26AS show any such deduction entries? I want to claim a deduction under Chapter VI / other exemptions / allowances in my income tax return which is not in my Form 16? Can I do it? Is Form 26AS different from Form 16? My Form 16 is incorrect, what should I do? I switched my job during the year, how should I file my return now? Income Tax Law, mandates the employer who holds TAN no and deduct tax on salary of employee to issue Form 16. If your tax is not being deducted then your employer can refuse to issue Form 16 to you. It must be issued by 15th June of the year for which it is being issued. For example, for the F.Y. 2017-18, the due date for issue of Form 16 shall be 15th June, 2018. If any employer delays or fails to issue Form 16 by the specified date, then he is liable to pay a penalty of Rs.100 per day till the date the default continues. Understanding & learning how to fill form 16 is very simple. It is divided into two sections- Part A and Part B. As per the procedure laid down by the Income Tax Department, the person deducting your tax files return with the government. Thus, The TDS entries get updated in the department’s database once your employer files the TDS return. The last date to deposit the TDS for the month of March is April 30. The TDS return for the last quarter (Jan to March) is to be filed latest by 31st May. After the TDS return is filed, it takes 10 to 15 days to reflect the entries in department’s database. Then after, your employer downloads the Form-16 and issues it to you. It assists in the process of filing your income tax return with the Income Tax Department. Many banks and financial institutions demand Form 16 for verification of the person’s credentials while applying for loans. How do get Form 16? Form 16 is issued by your employer and you can expect it by the end of May/June. But if it’s not issued by the end of June, then you may demand it from your employer. Generally, the accounts or HR department issues Form 16. 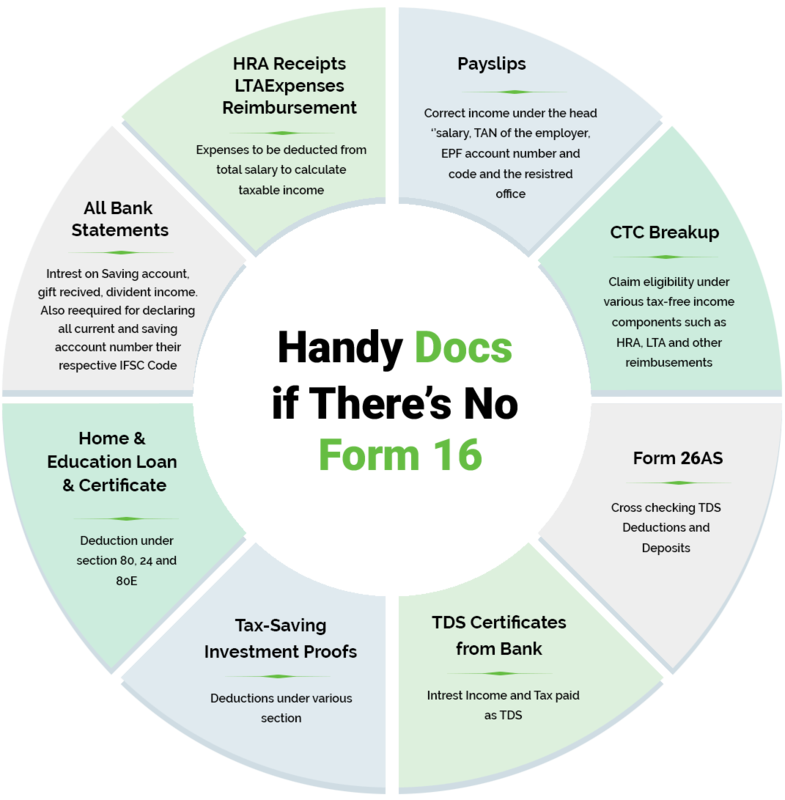 Form 16 is the most important document for you to file your income tax return and you should preserve this document carefully. But if you’ve lost it, do not panic, check your mail whether it has been emailed to you by your employer or not. If it’s not sent to you on your email, then you can simply request your employer to issue a copy of Form 16. No, a Form 16 is not equivalent to an Income Tax Return but it’s the source document for your salary income. It is really helpful, especially in case your entire income is from salaries and there is no other source of income. Further, you don’t need to attach your Form 16 with your income tax return. If your Gross Total Income exceeds 2,50,000 [for F.Y. 2017-18] then it is mandatory to file income tax return. Your employer is liable to issue form 16 only when he has deducted tax from your salary. If your employer does not deduct tax and your income exceeds the specified limit then even if you don’t have form 16, you are required to file return of income. If you haven’t received a Form 16, then for the purpose of return filing, you will have to refer to your salary payslips, bank statements, tax-saving investment proofs, home and education loan certificates and Form 26AS etc for filing income tax return. While payslips contain details of your income like basic salary and allowances, Form 26AS contains the details of all your tax deducted and tax paid. The Form 26 AS can be viewed / downloaded from the Income Tax Department’s online portal i.e. www.incometaxindiaefiling.gov.in. Transport Allowance = 2,000 x 12 months = 24,000 but subject to an exemption of Rs. 1600 per month. Therefore, 400 x 12 = 4,800 is taxable. Hence, the Taxable Income [after deducting the basic exemption limit] of Ms. Tania will be Rs. 64,800 (3,60,000 + 4,800 – 2,50,000 (basic exemption) – 50,000 deduction for home loan). In such a case, where your employer deducted tax from your salary, but you are not able to trace such deduction in Form 26AS, then it may happen that your employer has deducted the tax from your salary but has not deposited the same in the credit of the Government account. And, in such a case, you must pay full amount of tax while filing your income tax return. Also, you should immediately bring this matter or default to the notice of your employer. Need a CA to bail you out of this situation? Connect Now. In a case where your employer issues you a Form 16 without any deductions, you can still claim the deduction in your income tax return. Form 16 is just a certificate issued by your employer which certifies deduction of tax (TDS) on your salary. It’s just a base document for return filing and not the final return itself. You can always take the benefit of the deductions you are eligible for, while filing your income tax return even if the same are not mentioned in your Form 16. Trouble filing your income tax return? Just click here! Contains details of tax deducted at source (TDS) for all the heads of income. Contains details of tax deducted at source (TDS) for the income from salary only. The details of other heads of income can also be provided in your Form16, in case you have provided the details of other income to your employer. Provided on the Department’s site based on data submitted by all the Deductors. Issued by your employer to you. In case, where a Form 16 is duly issued but with a mistake, then the same can be rectified by your employer on your request. Subsequently, a revised Form 16 will be issued to you by your employer. It is very much possible for you to change your job in the middle of the year, but then you may be wondering who will issue Form 16. In case, you had two employers for the year, you will get Form 16 from both the employers for the respective months served by you. The income tax return will be filed by combining the details of both the Form 16s. But you must be careful in doing so because it might happen that both your former and present employer has calculated your tax after taking into the consideration the basic exemption limit. In such a case, you are not entitled to take the benefit of exemption limit twice, but only once. The same applies to all deductions and allowances during the year, as any deduction / allowance can be claimed only once or as per the respective rules of the income tax law even if it is reflected in both the Form 16’s. For example, let’s say, in the year 2017-18, you worked with a company X Pvt. Ltd. for a period of 6 months for a salary of Rs. 45,000 per month and for the rest 6 months you joined Y Ltd. for Rs. 50,000 per month. In such a case, you draw a salary of Rs. 2,70,000 from X Pvt. Ltd. and Rs. 3,00,000 from Y Ltd. Now, both the companies X Pvt. Ltd. and Y Ltd. will deduct your tax after consideration of the basic exemption limit (i.e. Rs. 2,50,000/-) only and your Form 16 will be based on the same. This means X Pvt. Ltd. will charge tax on the balance Rs. 20,000 and Y Ltd. will charge tax on Rs. 50,000, each giving you an exemption of Rs. 2,50,000. But, at the time of filing your final return for the year, you will be allowed the basic exemption only once and not twice i.e. your tax should be charged on Rs. 3,30,000. (Rs. 300000 + 270000 – 250000). Further, when you switch jobs in a year, then you should furnish your previous employer’s TDS details to your new employer in Form 12B. Q Will I get Form 16 from my employer even if there is no TDS? 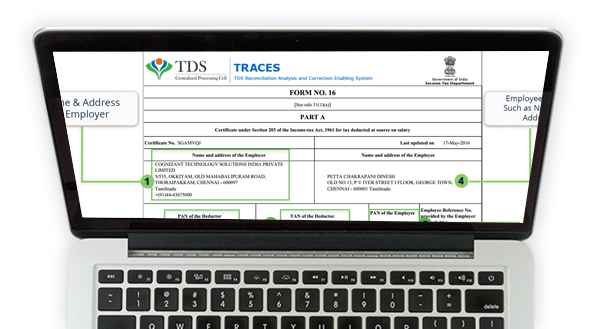 Form 16 is a TDS certificate & it is issued only when there is tax deducted. Therefore, if there is no tax deducted, employer is not required to issue Form 16 to you. Purpose of form 16 is to serve as a proof of tax deducted & deposited on your behalf. Q How do I upload Form 16 & file my ITR online with Tax2win? Our user-friendly interface helps you file ITR within minutes. Upload Form 16: Visit our e-filing portal, select your sources of income & upload form 16.
Review: Our advanced software automatically picks up the required information & fill your details by itself. Simply review the information. File ITR: As soon as you give your confirmation, our system files your income tax return online. Q When Form 16 is required? What is importance of Form 16? Form 16 is required when you are filing your income tax return. This form serves as a proof that your employer has deducted & deposited tax from your salary with income tax department in your name. Q What is Form 16 issue date? All the employers, if they deduction TDS, are required issue Form 16 by 15th June of the financial year. Q What is Income from salary? How it is related to my Form 16? Any amount received from your employer during employment period is called Salary. Usually it comprises of basic salary, allowances, bonus, pension, wages or any other benefit given in relation to your employment. When employer deducts tax from your salary, he issues Form 16 to you. This form is an acknowledgement from your employer that he has deducted tax from your salary. Q I receive pension income. Is it taxable as salary income & will I receive Form 16? Yes, pension income is taxable under the head “Income from Salary”. If it is exceeds the basic exemption limit then provisions of TDS shall become applicable & Form 16 is required to be issued by your employer. Further, pension received from United Nations Organisation & by kin of Armed Forces is exempt. For more detailed explanation on taxability of pension, refer our blog. Q I receive family pension income. Is it taxable as salary income & will I receive Form 16? No, family pension is not taxable under head “ Income from Salary” because it comes within ambit of “Income from Other Sources”. Therefore, Form 16 is not required to be issued in such case. Q I have received arrear and/or advance salary income. Will my employer consider relief u/s 89 to calculate TDS on salary? Yes, your employer is required to consider Sec 89 of Income Tax Act for calculation purposes, in case you receive any arrears or advance salary income. Refer our blog for detailed information on sec 89. Q How do I file my ITR online through Tax2Win? At tax2win, for filing online income tax return you can choose amongst the two available options as per your convenience. One is SELF FILING and the other is CA ASSISTANCE. If you wish to opt for eCA then you just have to answer few simple questions & accordingly we will recommend the best suitable plan for you. Pay online for your plan & our eCA will get in touch with you. Share all your tax problems, upload relevant documents & let your personal eCA do the hard work for you. Additionally, if you want to opt for self filing then you can easily file your ITR online with us and that too for FREE. Visit Tax2Win, choose “File It Yourself” option & select all your income sources. Upload required documents, confirm & voila your ITR is filed. Q I filed my ITR online. What should I do next? You need to verify your ITR within 120 days of filing it, so that income tax department can process it further. It is very important to note, if you do not verify your ITR it shall not be considered as filed. To know how to e-verify your return, click here. Q What is the difference between Form 16 & 16A? Both Form 16 & 16A are TDS certificates. While Form 16 represents tax deducted on your salary income, Form 16A represents tax deducted on income other than salary. Want to know more about Form 16A, visit the page. Q I want to know more about Form 16 structure in detail & how to read form 16? You can visit our glossary page on Form 16. Here, you can see the full structure of Form 16 & see all the components of it. In case, you have any doubt(s) or want any clarification, feel free to contact us at [email protected] or call us at +91-9660996655!